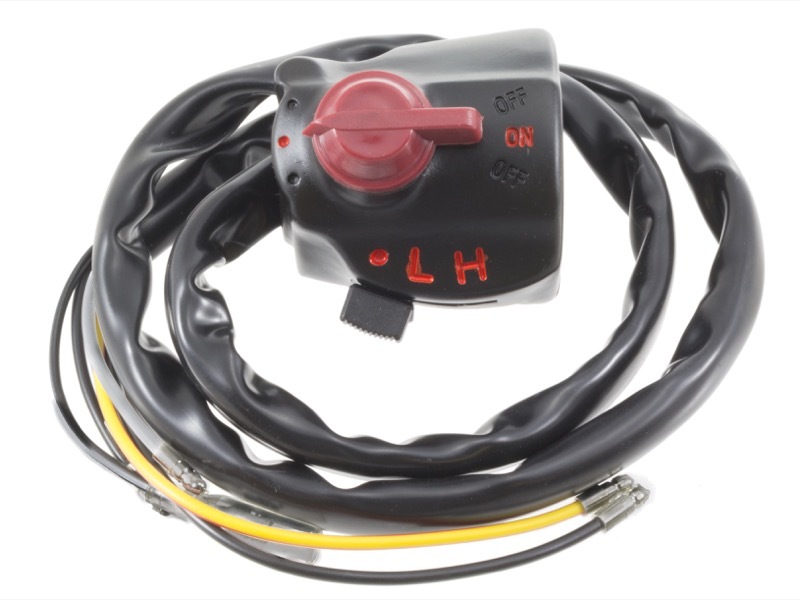 Why You Need This: You may have discovered that handlebar switch boxes are a commonly broken or malfunctioning electrical part on your vintage Honda. While many of the boxes look similar to one another, there are in fact several different variants of handlebar switch boxes. The K5-K7 Honda CB450 as well as the CB550 K and F models use their own special variant; the unique aspects are that it is designed to be used with front disc brake set up. The master cylinder is butted up right next to the right hand switch box, while only a single throttle cable runs out from the bottom of the box on the CB450, and a dual cable setup on the CB550. This is what we call an early-style switch box, as it has typical kill switch on top, but has the combination headlight control (off, low and high beam all in one place) along with the electric starter switch. While this right hand switch box is designed to fit the K5-K7 Honda CB450, it can be made to work with other Honda models from the same era. 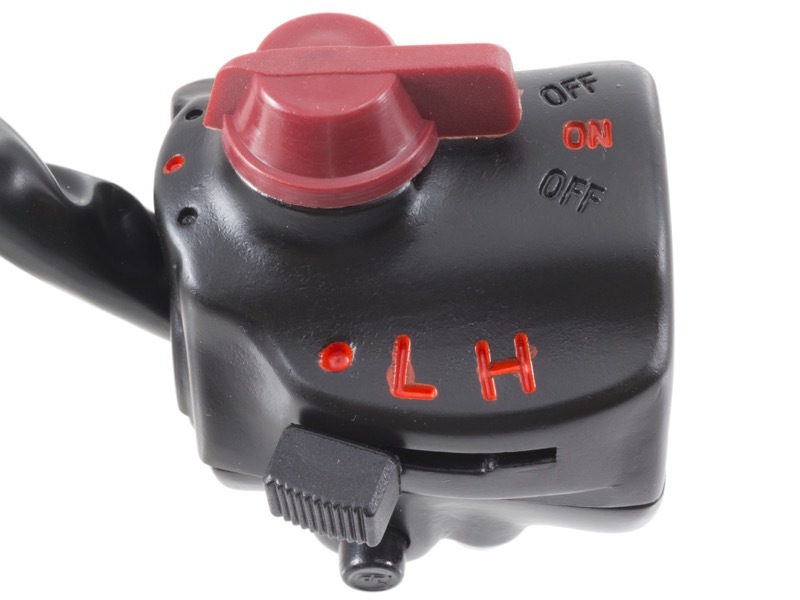 For example, many of the CB550 switch boxes have the headlight hi-lo switch on the left, with an on-off on the right. Since this one incorporates both into a single switch on the right, our left hand switch box has no hi-lo switch. It can also be adapted to fit for a *Honda CB350 that uses the front drum brake by adding our brake lever perch and brake light switch. 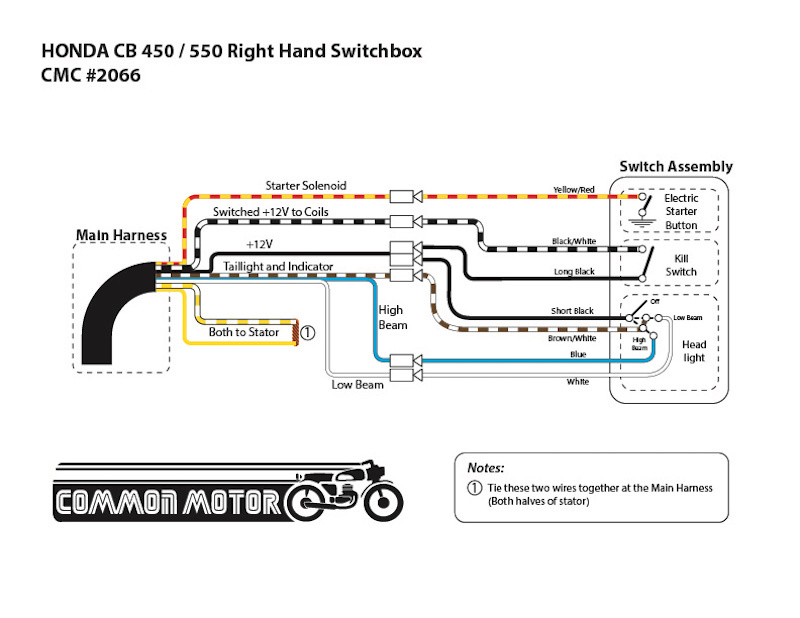 Note: The current configuration of this switch box is a dual cable version that appeared on later model bikes like the CB550K and CB550F models. We modify it to be used on the CB450 which only uses a single pull cable, thus we close the unused hole with a Delrin plug. This differs slightly from the current picture on the website. Installation Tip: The switch box utilizes the electrical wires to run through the stock factory handle bars. Tie a piece of string to the end of the wires and lace them through the handlebars. Spraying the wire housing down with some Windex will help lubricate them during the installation. The wiring of this switch may be slightly different from the original factory unit. White / Yellow........... (Connect leads from bike harness together in headlight bucket. Note: *Honda CL450 and CL / CB350 have the brake lever perch built into the bottom half of the switch box for a drum front brake. 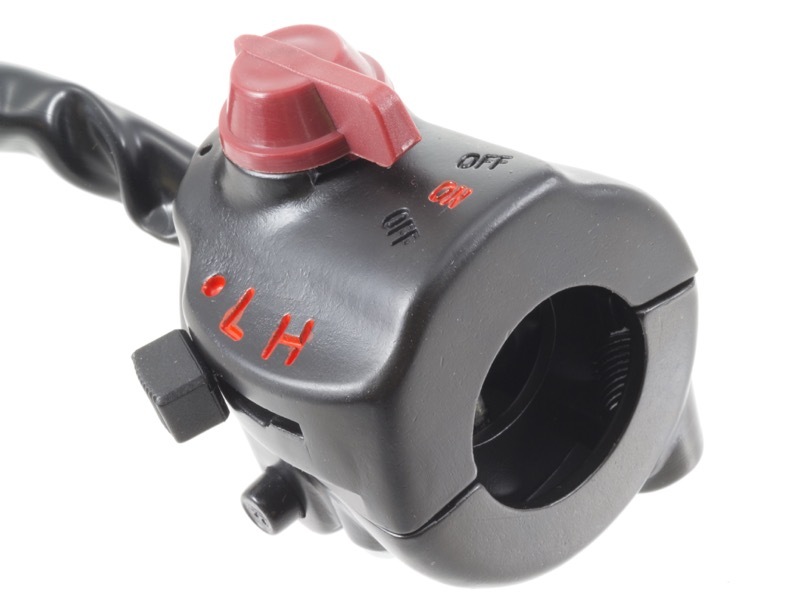 This switch box can be made to work with front drum brake by using our brake lever perch and brake light switch as a replacement for the built in brake perch. As with Everything from CMC... PERFECT! Good quality switch gear. Installed on a 1974 CB200. Fit well and works perfectly.